It’s hard to imagine a more magical way to begin a museum visit than to step inside The Infinity Mirrored Room at The Broad Museum. Artist Yayoi Kusama has covered the walls, floor and ceiling with mirrors. LED lights hang from the ceiling and are reflected everywhere you look. The lights sometimes move with the closing of the door, and create a wonderland of infinite color. The shimmering installation is absolutely transporting — but can only be viewed for 45 seconds. No more than two or three people at a time can enter this small space, and there’s a long line of others outside, patiently waiting to get in. It’s hard to be mad though, because the guard who ushers you out is so knowledgeable and pleasant … and he’s not an outlier. At the five-month-old Broad Museum, guards aren’t just there to protect the beautiful and provocative art. They are there to engage with visitors — talking and teaching about the artworks. Guard Sabrina Gizzo might easily be mistaken for a docent. She’s talking with some visitors about Thomas Struth’s huge color photograph of a crowd at a museum in Florence Italy. In the photo, tourists are dressed in summer clothes — shorts, T-shirts, caps, sneakers. Struth photographs the crowd facing us, looking up at something we can’t see. 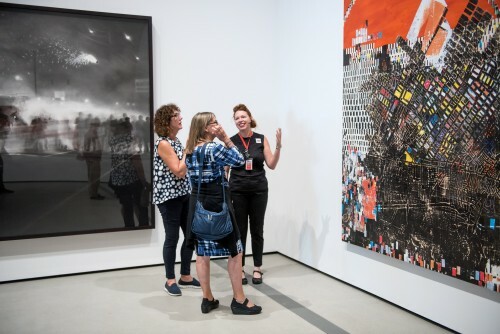 As Los Angeles visitors to The Broad study Struth’s photograph — a museum crowd looking at another museum crowd — one Broad visitor notices that a man in the photograph is wearing sunglasses clipped to the front of his shirt. Gizzo suggests her guest take a very close look at the sunglasses. Why? Turns out, if you look closely, a famous statue can be seen in the reflection of the man’s glasses: Michelangelo’s sculpture of David. I’ve looked at Struth’s photograph several times and never noticed the reflection until now. Once Sabrina Gizzo points it out, our pleasure in the artwork deepens. In the museum mecca of Washington, D.C., gallery guards wear cop suits and immobile faces. The Broad guards have no uniforms — they wear black clothes, bright red lanyards and big smiles. They schmooze about the art and the building, and politely keep visitors from getting too close to the work. Lauren Girard, Associate Director of Visitors Services, hired and trained them to do a bit of everything. At The Broad on any given day there are 50 VSAs. They’re paid $12.50 an hour, for a maximum of 30 hours. (In case you’re wondering, the museum also has staffers devoted entirely to safety and protection. “We have a state-of-the-art security system that includes security guards whose sole job is traditional security,” says Joanne Heyler. “We have cameras everywhere … as well as with human eyes. But a part of the VSAs jobs, one of the essential parts, is to keep the art safe and to keep people safe.”) The VSAs have all had 40 hours of training — with curators and online — learning about the building, the artists, the artwork, and how to respond in delicate situations. Let’s say, for example, a visitor says he hates a work in the collection. In one gallery, Celia Lopez — who like many VSAs is also an artist — is explaining to a difficult visitor (me!) why a vacuum cleaner is on display in an art museum. Sometimes artists whose work is included in The Broad collection visit the museum. When local artist Mark Bradford asked to come and speak with the guards, VSA and filmmaker Caleb Hammond was thrilled. Glenn Ligon — a New York artist who explores themes of race and identity — got the rockstar treatment when he visited. Back in the gallery, visitor Luke Fair turns guide Celia Lopez’s attention from the Koons vacuum cleaner to a shimmering aluminum and copper-wire wall drape from Nigeria. Admiring the work from up close and afar, the visitor and the guide are having a splendid conversation — it might just make their day. And this makes Visitor Services Director Lauren Girard proud. It seems to be working: Online advance tickets are booked for months. And, without tickets, weekend visitors to the Broad can wait for hours. But that twinkle room is worth the wait! This entry was posted in KRTS News and tagged Contemporary Art. Bookmark the permalink.